at any rate, just a quick update here. 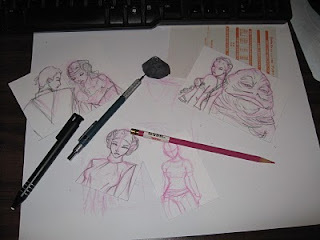 i'm currently working on some sketchcards for a charity and out of the subject matters they said we can draw, i chose Star Wars (cuz the others i didn't know =P). so here are a few so far but they're not finished. i plan on inking and graying them. once i get approval, i'll post them finished. i still have a few more that i haven't even started yet. but i plan on being done by this weekend so yay!